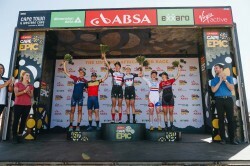 Once again Annika Langvad and Kate Courtney stamped their authority on the Women’s category of the Absa Cape Epic when they collected their third win in three days over the 106km out-and-back Stage 2 from Robertson on Tuesday. A brutal attack 30 kilometres from the finish allowed the Investec Songo Specialized pairing to drive home the advantage gained on the opening two days of racing, and by winning by over four minutes they have extended their lead to a daunting six and a half minutes over Team Spur’s Ariane Lüthi and Githa Michiels. While the leaders are turning this into a one-team procession, the dice for second remains intriguing with the Spur pair edging out Mariske Strauss and Annie Last (Silverback-KMC) by the narrowest of margins after a tense sprint on Tuesday. Their brutal tussle for podium places left Michiels lying prone on the finish line at the end of the stage and glassy-eyed as she prepared for the podium presentation. Spur are now over six minutes ahead of their young rivals in the fight for second, but with Wednesday’s 122km stage followed by another 111km brute on Thursday, Michiels’ recovery is going to be key to their fight for the second step on the podium. Team Ascendis Health finished fourth once again on Tuesday as Robyn de Groot had to nurse Sabine Spitz to the finish as the German continues to struggle with illness. The pair lost another 12 minutes to the leaders and are now 26 minutes off the pace with stage wins the only realistic target remaining if Spitz can recover fully. “There was a pretty steep climb about 30 kilometres to go and Annika got on the front and set the pace and I just hung on for dear life. We managed to get a gap and then hold it to the finish. Behind the dominant leaders, as the chasing pair of teams were approaching the finish, it seemed as if the Belgiun Michiels had lost the group and there were a few questions as to whether Lüthi would slow down to help her obviously struggling teammate. The Swiss three-time Absa Cape Epic winner said dropping back was not an option. “I just believed in Githa. I knew she was super strong, but I was also completely on my limit and needed to save my energy. I knew I could not have gotten her back. I felt the pace was slightly dropping and I was betting on her strength and I was right. A tired Michiels, who collapsed off her bike on the finish line for almost two minutes before moving off to the recovery zone, said later she could not clearly remember the finish. In the race to be the inaugural Absa African Women’s special jersey champions, Candice Lill and Amy Beth McDougall (dormakaba) had a tough day and finished seventh women overall, but still increased their lead to just under an hour as Hannele Steyn and Jeannie Dreyer (Nolands Spar) moved into second, overtaking Nadia Visser and Katie Lennard (Western Girls).